Signs of the city, fire escapes -- Nikon D300 Tamron 17-50mm @ f/11 1/100th ISO 200Fire escapes clinging to the sides of buildings both tall and short always remind me of city life for some reason, in particular New York City. 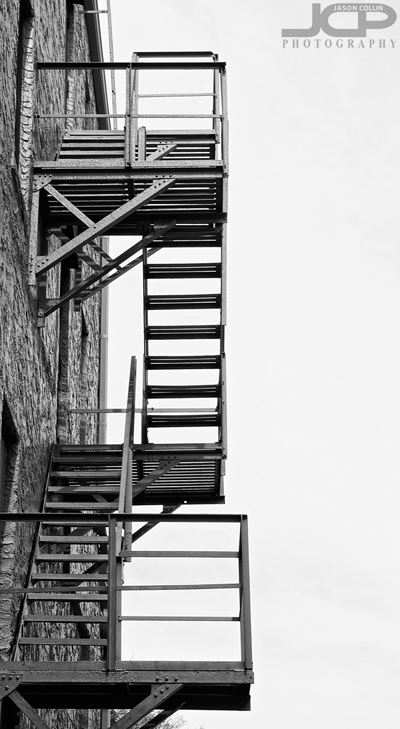 As the above shot was made right here in St. Petersburg, Florida, fire escapes are not exclusively found in big cities. I have never actually even been on a fire escape, but when I see them I always imagine making a narrow escape from a sticky situation, or covertly gaining access to a rooftop.